The Hollies01328 878304work01328 830786fax Self-cateringThe Hollies is a newly built flint-faced bungalow situated in the heart of the village of Binham, comfortable furnished and extremely well equipped, with French doors opening onto a private walled garden with suntrap patio. The Hollies sleeps four, consisting of one double and one twin bedded rooms, kitchen, lounge/dining area and bathroom with over-bath shower. The bungalow has full oil fired central heating, a fitted kitchen with electric cooker, refrigerator, washing machine, dishwasher and microwave. The private walled garden has a patio area with picnic table and barbeque, ideal for this hot summer evenings or a lazy day in the sunshine. Electricity and heating are inclusive of tariff. The Hollies is a newly built flint-faced bungalow situated in the heart of the village of Binham, comfortable furnished and extremely well equipped, with French doors opening onto a private walled garden with suntrap patio. 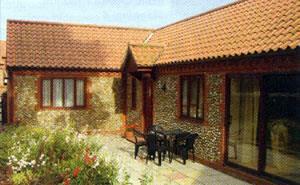 The bungalow is available from 3pm on day of arrival and must be vacated by 10am on day of departure. Kitchen fitted with modern units, electric cooker, refrigerator, auto.washing machine, microwave and dishwasher. Walled garden with suntrap patio. Children welcome from age 8. The village of Binham is approximately four miles off the A148 at Thursford. Watch for the brown and white signs to 'Thursford Collection' and follow the road signs through to Hindringham to Binham. Once in the village take a second turning right. Look out for the village sign on the junction; The Hollies is situated on the left through an archway opposite the village shop.